?? ?~1792: born in Kamigata. His first stage name is Ogino Tôzô. Fall 1792: Tôzô goes to Edo. 11th lunar month of 1792: Tôzô plays at the Ichimuraza a wakashugata role in the kaomise drama "Iromigusa Tsukuri Yamabushi". 1st lunar month of 1795: Namiki Gohei I's drama "Godairiki Koi no Fûjime" is staged for the first time in Edo, at the Miyakoza; Tôzô plays the role of the yakko Tatahei [casting]. 7th lunar month of 1796: he becomes a disciple of the star Sawamura Sôjûrô III and takes the name of Sawamura Tôzô I at the Miyakoza, playing the role of Sukune Tarô in the "Dômyôji" scene of the drama "Sugawara Denju Tenarai Kagami". 9th lunar month of 1796: the play "Hikosan Gongen Chikai no Sukedachi" is staged for the first time in Edo, simultaneously at the Kiriza and the Miyakoza; Tôzô plays the role of Harukaze Tôzô in the latter theater [casting]. 11th lunar month of 1808: Sawamura Tôzô I takes the name of Sawamura Shirogorô II and becomes katakiyaku. Around the same time, he gets married with the daughter of Sawamura Sôjûrô III. 3rd lunar month of 1809: premiere at the Moritaza of Fukumori Kyûsuke I's drama "Sono Mukashi Koi no Edo-zome"; Shirogorô plays the roles of Beniya Chôbê and Arai Genzô Shigekuni [casting]. 3rd lunar month of 1810: premiere at the Ichimuraza of Katsu Hyôzô I's drama "Kachi Zumô Ukina no Hanabure" (commonly called "Shirafuji Genta"); Shirogorô plays the role of Shioda Bannoshin [casting]. 5th lunar month of 1810: premiere at the Ichimuraza of Katsu Hyôzô I and Sakurada Jisuke II drama "Ehon Gappô-ga-Tsuji"; Shirogorô plays the roles of the farmer Sagoemon and Sasayama Kanbei [casting]. 7th lunar month of 1811: premiere at the Ichimuraza of "Tamamo-no-Mae Obana no Nishiki", the Kabuki adaptation of the puppet theater drama "Tamamo-no-Mae Asahi no Tamoto"; Shirogorô plays the role of Washizuka Kintôji Hidekuni [more details]. It was followed by the premiere at the Ichimuraza of the drama "Nazo no Obi Chotto Tokubê"; Shirogorô plays the role of the ashigaru Namano Hachinai, later Mikawaya Giheiji [more details]. 3rd lunar month of 1813: premiere at the Moritaza of Tsuruya Nanboku IV's play "Osome Hisamatsu Ukina no Yomiuri" (commonly called "Osome no Nanayaku", in English "The seven roles of Osome"). The seven roles are played by Iwai Hanshirô V; Shirogorô plays the roles of the tedai Zenroku [casting]. 3rd lunar month of 1814: premiere at the Ichimuraza of Tsuruya Nanboku IV's drama "Sumidagawa Hana no Goshozome", commonly called "Onna Seigen"; Shirogorô plays the roles of Matsui no Gengo Sadakage and the yakko Sudahei [more details]. 5th lunar month of 1815: premiere at the Kawarasakiza of Tsuruya Nanboku IV's drama "Kakitsubata Iro mo Edozome" (commonly called "Oroku to Gantetsu" or "Dote no Oroku"); Shirogorô plays the role of Sadaijin Magoroku [casting]. 7th lunar month of 1815: premiere at the Kawarasakiza of Tsuruya Nanboku IV's drama "Haji Momiji Ase no Kaomise" (commonly called "Date no Jûyaku", in English the ten roles of Date), whose plot and characters belong to the "Meiboku Sendai Hagi" world; Shirogorô plays the role of Yamana Mochitoyo [casting]. 11th lunar month of 1819: Sawamura Shirogorô II takes the name of Sawamura Tôjûrô I at the Tamagawaza, playing 3 roles in the drama "Nana Komachi Yagura no Amagoi". 3rd lunar month of 1820: premiere at the Tamagawaza of Tsuruya Nanboku IV's drama "Sakura Butai Maku no Datezome"; Tôjûrô plays the roles of Ukiyo Tôfuya Tohei and Ôe Onitsura [casting]. 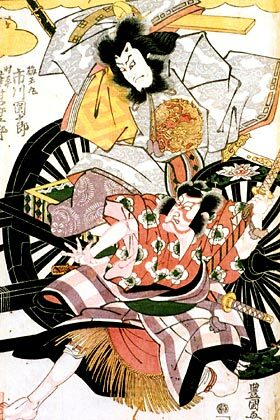 11th lunar month of 1821: he takes back the name of Sawamura Shirogorô II at the Ichimuraza, playing in the drama "Nani o Tanete Ukiki no Kaobure". 3rd lunar month of 1823: premiere at the Ichimuraza of Tsuruya Nanboku IV's drama "Ukiyogara Hiyoku no Inazuma"; Shirogorô plays the role of Mamushi Jihei [casting]. 8th lunar month of 1824: Sawamura Shirogorô II takes the name of Sawamura Shabaku at the Ichimuraza, playing 3 roles in the drama "Imoseyama Onna Teikin". 5th lunar month of 1828: Shabaku plays at the Ichimuraza the role of Fujiwara no Shihei in the drama "Sugawara Denju Tenarai Kagami". 11th lunar month of 1828: he takes back the name of Sawamura Shirogorô II at the Ichimuraza, playing 3 roles in the drama "Mitsugi no Yuki Genji Biiki". 3rd lunar month of 1829: he goes on tour to Ôsaka with Ichikawa Danjûrô VII. 1st lunar month of 1830: he performs in Ôsaka at the Naka no Shibai, then decides to go back to Edo. 6th day of the 7th lunar month of 1832: Shirogorô dies in Edo. Sawamura Shirogorô II was a good katakiyaku of the Bunka and Bunsei eras. His vocal projection and the way he delivered his lines were quite stern and manly. He had a strong stage presence, allowing him to excel in roles like Fujiwara no Shihei ("Sugawara Denju Tenarai Kagami").